ANSWER: Every time somebody asks me about muscle training at home (with no gym equipment, or any barbells or dumbbells), my instinctive reaction is to question why. What do I mean by this? – I hear you ask. Well, it is obvious that anyone who wants to develop their physique is not in the best of circumstances, if they can not access a gym. Therefore, my first priority is to identify the main obstacle that is causing this problem. Is it impossible for you to access any gym? Could you, perhaps, purchase a few less iPhone apps and use that money to become a member at your local gym? Could you discard some of the rubbish that has accumulated in your garage or basement, and acquire some barbells and dumbbells? In a minority of instances, these questions resonate with the person, which results in a resolution of the underlying problem. Consequently, their bodybuilding goals are put firmly back on track. However, far more frequently, people simply give negative answers to the above questions. In this situation, they are trapped in this clearly undesirable predicament. The welcome news is that it is certainly possible. There are home workout routines you can adopt that will develop your muscles, without all the elaborate equipment many gyms offer. Of course, not having any barbells or dumbbells is a hindrance. Nonetheless, it is definitely achievable. 1. Progressively overloading your muscles in a manner that stimulates their growth (in other words, increasing physical strength via a well thought out training regimen). 2. Adopting nutritional habits that facilitate muscle growth (in other words, eating the correct quantities of protein and calories). Providing each of these principles are adhered to regularly over time, muscles will develop. At this point, you might have realized that I made no mention of gym memberships, as part of these requirements. Also, I did not mention exercise machines, free weights, or gym equipment of any type. This is because none of this is what develops muscles. It’s just that they are generally the most effective tools for the task. Standard gym equipment enables you to perform the exercises that work each group of muscles effectively. This provides your muscles with the requisite growth stimulus. Also, this equipment makes it easy to increase the weight you use with those exercises, which allows progressive overloading to occur continuously. 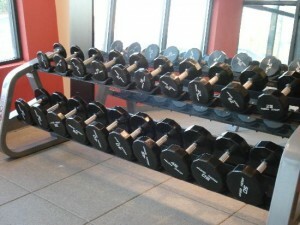 This is why gyms are packed with free weights from five pounds to 100 pounds plus in five pound increments, plates and barbells from as little as 2.5 pounds up to forty-five pounds (also in five pound increments), adjustable benches that can be positioned at different angles, racks that can be used for different exercises, and cable columns and other machines for each group of muscles – with resistance levels that can be changed in tiny increments, by simply placing a pin into another slot. Therefore, I am going to be perfectly honest here. If building muscle is your goal, using the above equipment is the preferred option, both in terms of results and efficiency. If you can’t access all of it, you might be slightly handicapped. However, if you can’t access any of it, you are going to be majorly handicapped. Notwithstanding, as I said previously, it is still possible. There are lots of different methods that can be employed for this task (developing muscle), and even less-than-ideal methods can achieve the goal, if they are correctly applied. So…how should you go about it? Obviously, this is not intended to be an exhaustive list of exercises you can do with your body weight. You will discover many more, if you hunt around online. For example, you can find a very useful bodyweight exercises chart here or subscribe to our monthly newsletter and you’ll receive a complete handbook on bodyweight training for FREE. However, the list above is sufficient to accomplish the stated goal. There are several exercises on the list that can be combined into a good muscle building regime — one which would be suitable for home use, with no costly gym equipment or barbells/dumbbells of any type. Thank goodness for your body weight! In addition to this, if you include something as simple as bands, you will be able to perform many other exercises as well (band pull downs, band rows, band lateral/front raises, band presses, band tricep extensions, band curls, etc). Making progress with these exercises (the most important part of muscle development) can be challenging, particularly as you become stronger. Suffice to say, the weight of your body is not immediately adjustable. You can not simply add five pounds and move onto the following weight, like you do with dumbbells and barbells. Happily, this will not be a huge problem initially, because there are a couple of excellent solutions. Firstly, you can progress from a less demanding exercise to a more demanding one (for example, from performing press ups on your palms, to performing press ups on your knuckles). That works well. Then, increasing the number of repetitions is great. For instance, if three sets of five reps is all you can manage on a certain exercise, you can progressively increase to three sets of twelve reps. However, at some stage, you will exhaust all your options for harder exercises. Also, if you continue to increase the number of reps, you will be training for muscular endurance, instead of muscle growth. Based on the particular exercise, there is virtually always some way of making it harder, adding some extra resistance to it, or increasing the tension in a manner that allows progressive overload to carry on, so that muscles can continue to develop. All you have to do is invest the time and effort to decide how to do this, for every exercise you perform, and then take action on it. This is crucial. If you fail to do this, you will wind up like the majority of people who train at home, without any special equipment or free weights — constantly stuck in a rut, performing the same exercises, with little progress to speak of for as long as they choose to workout. Are the Muscle Building Regimes I Design Able to be Implemented at Home? Over the past twelve months, I have received thirty to forty emails from people who train at home, using different types of equipment. Some people have adjustable benches, full size racks, a comprehensive range of barbells and dumbbells, and even a gymnasium standard leg press (lucky guy!). Other people have a pull up bar and a few free weights. And others have no equipment at all. All of these people ask the same question though: Can these workout regimes still be used effectively? Clearly, the answer depends on precisely what equipment each person has access to. However, as a general rule, I would say that in most cases, everything that has to be done is doable at home using whatever equipment the person owns. Alternatively, it can be replaced easily, with a different comparable exercise. What is the Appeal of a Home Workout Routine in any Case? This is the reason why I prefer to categorize my exercise regimens as ‘effective workouts’, rather than ‘home workouts’. If you workout at home, with the bare minimum of equipment, you just have to adapt everything to your requirements, and make the necessary amendments to the exercises as appropriate (this is much simpler than you imagine). This way, you will wind up doing similar versions of standard exercises. From a technical standpoint, this means that ALL workouts have the potential to be ‘home workouts’. Complete all the ‘A’ exercises, followed by all the ‘B’ exercises, followed by all the ‘C’ exercises. Lie down looking up at the ceiling, with both feet on Valslides. Begin by extending your hips, while flexing your glutes. Next, keep your hips in this position and curl your feet beneath your knees. A straight line should be maintained, from your knees to your shoulders. Carry out a standard press up, while your feet are resting on a bench or small box. Use a shoulder width, supinated grip on a chin up bar. Pull your chest up to the bar, while squeezing together your shoulder blades. Position your feet on different Valslides, or a slideboard. Adopt the press up position, with a tight core and squeezed glutes. Keep your arms and legs straight, then move forward using your arms with your legs dragging behind you. This is just one example of a home workout routine you can do. Obviously there are tons of other home workout routines you can find online. So get started as soon as possible but make sure you keep my tips in mind!